In 1953, Cooper-Hewitt received from Richard C. Greenleaf (1887–1961) a gift of twelve pieces of embroidery and lace. One piece was an unusual band made in the Greek Islands in the eighteenth century. Embroidered using long-armed cross stitch in red silk on cream-colored linen, a portion of the design was copied from a much older pattern by the Italian designer Giovanni Andrea Vavassore (1510–1572). His book of embroidery designs, Esemplario di lavori or “Models of works” was published in 1532. While printed pattern sheets likely circulated before the sixteenth century, the bound books with designs for embroidery and cutwork proved to be a popular format in Europe. Published books came mainly from cities in Germany and Italy – centers of established international trade where higher rates of literacy guaranteed strong sales. In many cases, these early sixteenth century pattern books had designs that were neither novel nor highly sophisticated as the intended audience was not the expert needle worker. These are readily distinguishable as their dedications to virtuous work reveal that the patterns were meant to be easily executed by a different group – women of the aristocratic classes. Early patterns books were used repeatedly as sources of inspiration with some amateur needle workers taking patterns from different books to create new designs. They also became useful tools for teaching embroidery, and for this reason it is not surprising that these books had enduring value that extended to more remote European locations. Page from Vavassore’s Esemplario di lavori with a bird and cornucopia. Red and white embroidered bands bearing designs from pattern books are ubiquitous in textile collections. They were used to decorate many types of domestic linens such as towels, bedding and cushion covers especially in Italy and Spain, which explains why so many examples exist today. Designs range from simple geometric shapes to more complex patterns showing architectural elements, human figures, animals and mythological creatures. Cooper-Hewitt’s band has a complex arrangement of birds and mermaids along with overflowing cornucopias and other scrolling shapes. 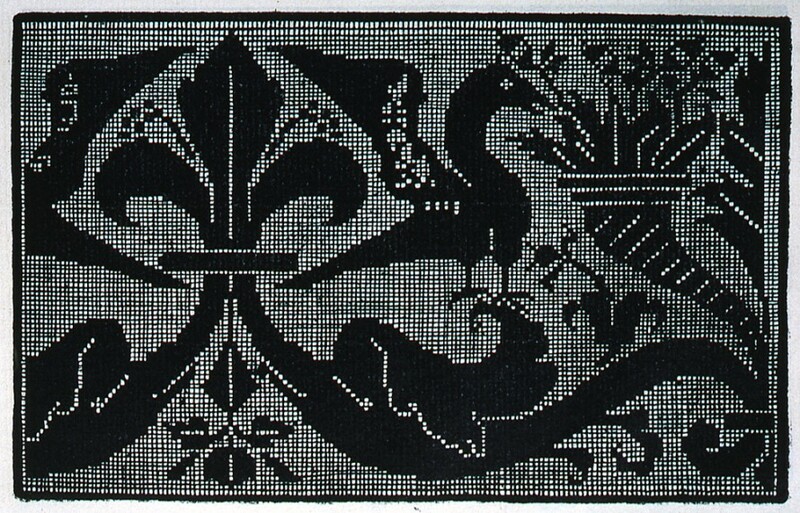 The confronted birds with cornucopias are copied from Vavassore’s pattern book, but the addorsed mermaids with scrolling forms, a very common motif of the sixteenth century, are from another source. The top half of the design is reflected below in a mirror image. Embroidered band, 18th century, Gift of Richard C. Greenleaf, 1953-60-2.